Isma is free. After years of watching out for her younger siblings in the wake of their mother’s death, she’s accepted an invitation from a mentor in America that allows her to resume a dream long deferred. But she can’t stop worrying about Aneeka, her beautiful, headstrong sister back in London, or their brother, Parvaiz, who’s disappeared in pursuit of his own dream, to prove himself to the dark legacy of the jihadist father he never knew. When he resurfaces half a globe away, Isma’s worst fears are confirmed. Then Eamonn enters the sisters’ lives. Son of a powerful political figure, he has his own birthright to live up to—or defy. Is he to be a chance at love? The means of Parvaiz’s salvation? Suddenly, two families’ fates are inextricably, devastatingly entwined, in this searing novel that asks: What sacrifices will we make in the name of love? Home Fire is a modern retelling of the Sophocles play Antigone, and while you don’t need to be familiar with the original in order to appreciate this story on its own merits, I do think it adds to the reader experience. For those who are familiar with the play, you will recognize echoes of certain names, which will give you an idea of the trajectory of the story. Ismene from the original becomes Isma, Haemon becomes Eamonn, and Antigone becomes Aneeka. Shamsie has not simply rehashed the original story in a new setting, however, and I think a lot of the appeal of the novel lies in the ways she’s adapted it to anchor the story firmly in modern society’s relevant struggles. Recasting the major characters as Muslim women struggling with extremism within their family as well as prejudice and unfair assumptions from others makes the story more recognizable to a modern audience. The characters were extremely well developed, particularly Aneeka. Her deep sense of devotion towards her brother is at odds with the immorality of his actions. The novel really grapples with the question of where to draw the line when it comes to family loyalty. For Isma, Parvaiz has crossed that line by joining a terrorist group. She feels betrayed by him and feels no qualms about going about her life with no sense of allegiance to him. For Aneeka, who had always been much closer to Parvaiz, it is not that simple. She would do anything to have her brother back and is willing to forgive. What makes Aneeka interesting to me is he nuance, which comes through in the ways she chooses whether or not to adhere to particular aspects of her faith and through the morally questionable choices to makes that are, at their core, motivated by love. 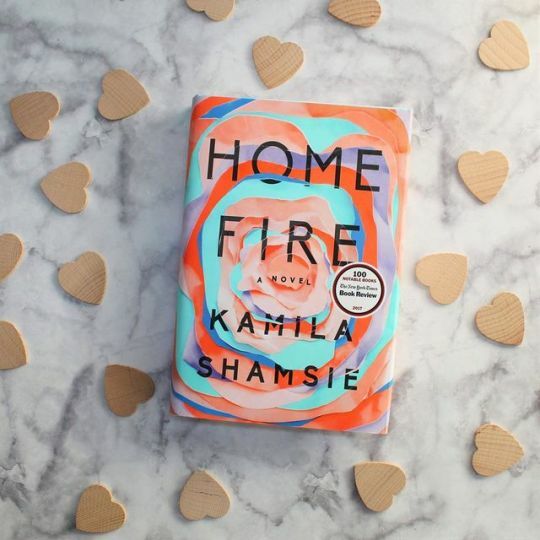 Home Fire is a brilliantly written novel which pays homage to Antigone while adapting it to our modern world, exploring themes of racism, classism, faith, familiar and romantic love, and more. It was longlisted the Man Booker Prize in 2017 and won the Women’s Prize for Fiction in 2018. Thank you for reading! Have you read Home Fire? Please share your thoughts in the comments! Previous Post Book Giveaway on Tumblr!